Shot In The Heart! Palestinian hospital personnel stand next to the body of Jihad Fareq, 8, who was killed during clashes with Israeli soldiers, at a hospital in the West Bank town of Nablus Monday Nov. 25, 2002. Hundreds of Palestinian youths defied an Israeli military curfew Monday and threw stones at soldiers who opened fire, killing Fareq and wounding seven people. Palestinian hospital staff show the body of Briton Iain Hook, director of the United Nations reconstruction project of Jenin refugee camp, at a hospital in the West Bank town of Jenin Friday Nov, 22, 2002. The U.N. official was hit by Israeli fire when the soldiers were shooting trying to disperse stone-throwing Palestinian youths. Israeli military delayed the arrival of paramedics by an hour and by the time the Israeli ambulance arrived, Hook no longer had a pulse, the officials said. A Palestinian boy kneels to take cover while an Israeli tank fires after an Israeli army bulldozer demolished a Palestinian police post on a road near the crossing of the Jewish Netzarim settlement in southern Gaza, Friday June 21, 2002. He was killed shortly after this photo was snapped. Palestinians, working in their family field, take cover while an Israeli tank fires near the crossing of the Jewish Netzarim settlement in southern Gaza, Friday June 21, 2002. A few seconds later, one of the boys was killed by the Israeli fire. The cousin of Abed al Samad Shamalakh, who was killed in the morning during Israeli gunfire as he was working in his family field, cries with his brother (L) with the blood of the boy on his T-shirt after he carried him to a hospital from the field in Gaza Strip June 21, 2002. The mother of Abdel Samad Shamalakh, looks in disbelief at her son's face during his funeral in Gaza City, Friday June 21, 2002. The boy, who was working in his family's field, was shot and killed when an Israeli tank opened fire while a bulldozer tore down a Palestinian police post near the Jewish settlement of Netzarim. This is the same boy from the above picture. Notice up above he was ducking and no threat to them yet they shot him anyway! An Israeli armoured personnel carrier takes position in front of the Church of the Nativity in Bethlehem November 22, 2002. The Israeli occupation army launched a massive invasion into the holy city early Friday morning. Palestinian children lining up to get water. Palestinians don't have enough water to justify having running water while Israelis have enough for large swimming pools. Armed Israeli settlers walk past Star of David graffiti on a Palestinian house at the site where Palestinian gunmen ambushed Israeli troops recently, adjacent to what is now the location of a makeshift Israeli settlement expansion outpost, in the Palestinian town of Hebron, Tuesday, Nov. 19, 2002. Homeless Refugee Cat! Palestinian Abeer Attalah, 10, carries her cat as she walks in front of her destroyed family house, demolished by Israeli occupation forces earlier in the day, in the outskirts of Balata refugee camp, adjacent to the northern Palestinian city of Nablus Sunday Nov. 17, 2002. The Israeli army destroyed two houses where 27 Palestinians were made homeless by the demolitions. A view of Yanun, a Palestinian village in the West Bank, the day the families living here left under ongoing pressure from nearby Israeli settlers, Friday, Oct. 18, 2002. Once home to 25 families, the last of the Palestinians here said they were fleeing after four years of worsening attacks from Israeli settlers, who have erected outposts on hilltops overlooking Yanun. New Refugees! Eight-year-old Palestinian boy Naseem Sobih, center, cries, as does his younger brother Hazim, 4, while other family members grieve queitly, as they crowd into their car, and vacate their village of Yanun, under ongoing pressure from nearby Israeli settlers, in the West Bank, Friday, Oct. 18, 2002. A Palestinian youth tries to salvage some tomatoes as others watch an Israeli tank disappear after it destroyed a market stand when imposing a curfew in the West Bank town of Jenin Sunday Oct. 6, 2002. Death of a Grandchild. Shot in the forehead. Palestinian Salmah Ze'rob, grandmother of 15-year-old Ayman Ze'rob, faints when she sees his face at a morgue in Nasser Hospital in Khan Younis refugee camp in the Southern Gaza Strip, August 20,2002. Ayman was shot and killed by Israeli troops guarding the Jewish settlement of Morag, south of the camp. Palestinian children release balloons white, black, green and red, the colors of the Palestinian flag, during a demonstration for the release of Palestinian prisoners and for peace in the West Bank town of Bethlehem Tuesday Aug. 13, 2002. Palestinians have requested International Peacekeeping forces on their land as a buffer between them and Israel -- this was rejected by Israel. David vs. Goliath? A Palestinian boy uses a slingshot against Israeli tanks during a raid in the north Gaza Strip, July 29, 2002.
WHO'S LEFT? Ten year-old Iman al Hewete (L) and her brother, 13 year-old Tareq, at the Shefah hospital in the Gaza Strip July 24, 2002, after they were injured during an Israeli missile strike a day earlier. The children's mother and two brothers were killed in the attack. The hand and arm of a dead baby pokes out from the rubble of a building in Gaza, July 24, 2002. Debate raged in Israel on Wednesday over the wisdom of killing one of one man at the price of the lives of 14 Palestinians, nine of whom were sleeping children, and international condemnation of the devastating Gaza air raid. A day after the killing of Salah Shehada, it emerged that the U.S. made F-16 warplane that attacked his house used an American one-ton precision "smart bomb". CHILD'S BODY Palestinian rescue workers pull the body of a child out of rubble on July 24, 2002, after the air attack on a block of buildings in Gaza by Israel. Palestinian medical workers show the body of Alaa Matar, 10, to one of her relatives, Anwar Matar, second right, at Shifa hospital in Gaza City, Wednesday, July 24, 2002. The body of three-year-old Mohamed al Hewete lies next the body of his mother Mona in Gaza hospital, after they were killed in an overnight Israeli missile strike in the Gaza Strip July 23, 2002. Palestinian rescuers hold the body of a dead baby, found in the rubble of destroyed houses in Gaza City, Tuesday July 23, 2002. An Israeli warplane blew up the house of a leading Hamas militant in the Gaza Strip early Tuesday, killing 14 civilians while sleeping, nine of which were children..
Palestinians remove the dead body of a Palestinian woman from her house after it was hit by fire from an Israeli warplane during an attack on Gaza City July 22, 2002. TWO-YEAR-OLD NOOR Zakaria Hindi carries the body of his 2-year-old niece Noor, at the hospital in the Deir Balah refugee camp in Gaza Strip Saturday July 6, 2002. The baby and her 44-year-old mother Randa Hindi were killed Saturday morning while riding in a taxi in the Gaza Strip by Israeli tank fire. A Palestinian boy throws stones at an Israeli tank patrolling the Deheishe refugee camp, near Bethlehem July 5, 2002. A Palestinian girl searches for a balloon to buy in a downtown outdoors market in Bethlehem during a daytime lifting of the Israeli curfew Thursday July 4, 2002. A group of Palestinian boys in the Deheishe refugee camp in Bethlehem throw stones at an Israeli Mirkava tank July 2, 2002. BEHIND BARS ! Palestinian children look out of their house window after Israeli army imposed a curfew in Bettunia near the West Bank City of Ramallah June 21, 2002. SALVAGE THE BEAR ! A Palestinian girl carries out a stuffed bear from her family's damaged house near a metal workshop in Jabaliya refugee camp in the northern Gaza Strip, Thursday June 20, 2002. Israeli helicopters fired rockets at the shop injuring 13, two seriously. YOUNG REFUGEE Palestinian children kiss and take a last look at the body of Hussein al-Matwi, 9-year-old, who was killed by Israeli army forces as he stepped outside his home, a thatched hut, in the Nuseirat refugee camp in Gaza Strip Wednesday, June 12, 2002. HUSSEIN IS DEAD! The impoverished refugees sister and grandfather of Hussein al-Matwi, 9-year-old, who was killed by Israeli troops, cry as his body brought to their thatched hut in the Nuseirat refugee camp in Gaza Strip, June 12, 2002. A Palestinian man shows his sick baby to an Israeli soldier at the entrance to the Palestinian village of Al-Khader, north of Hebron, to allow them passage through the checkpoint Wednesday, June 12, 2002. (Reuters/Gil Cohen Magen) How can anyone hold up a parent with a sick child from getting to a hospital? An Israeli soldier aims his M-16 assault rifle towards Palestinians waiting to cross a military checkpoint near the West Bank town of Ramallah May 29, 2002. An Israeli Army jeep patrols along the barbed wire fence that Israel built to separate the northern outskirts of Jerusalem with the West Bank, near the Kalandia checkpoint Tuesday May 28, 2002. WAITING TO CROSS An elderly Palestinian, waiting to be allowed to cross, sleeps next to the Kalandia checkpoint on the outskirts of the West Bank town of Ramallah, Tuesday May 28, 2002. NO HOME ! A Palestinian boy sits on his family's belongings in the remains of their home destroyed by Israeli authorities in the east Jerusalem neighborhood of Beit Hanina Tuesday May 21, 2002. A Palestinian woman holds her child in front of her house destroyed by Israeli soldiers after authorities claimed the house had no building permission, in East Jerusalem neighborhood of Beit Hanina Tuesday May 21, 2002. Palestinian twins Abla, left, and Faten make drawings of their memories on the ruins of their home in the refugee camp in Jenin, on the West Bank, Saturday, May 4, 2002. The European Union said it deplored the fact that the United Nations had been forced to call off a fact-finding mission into Israel's assault on the Jenin refugee camp. Israel initially supported an international probe to clarify events in Jenin but later decided not to let in the U.N. mission, which U.N. Secretary-General Kofi Annan eventually canceled. Palestinian boys take a last look and kiss 2-year-old Hoda Shalof, killed after Israeli tank shelled her home, during her funeral in Rafah refugee camp in south Gaza Strip Wednesday, May 1, 2002. An Israeli soldier lights a smoke grenade in front of Palestinian demonstrators near the entrance of the Church of the Nativity in Bethlehem Wednesday, May 1, 2002. A Palestinian demonstrator, atop a barricade, waves a flag as international peace activists look on while covering their faces against a cloud of tear gas, during a protest in Ramallah, Friday, April 26, 2002. Palestinian university students provide volunteer labor cleaning the streets of rubble and dirt, left over from recent Israeli Army incursions, in the West Bank town of Ramallah, Thursday, April 25, 2002. Palestinian students inspect the damage made by the Israeli army in the library room of a school after the withdrawal of the Israeli troops from the West Bank city of Nablus April 24, 2002. The school was used as headquarters by the Israeli army during its incursion into the city. Doctors look at the bodies of three Palestinian children, who were killed in a car accident with an Israeli military jeep, at the Rafidya Hospital in the West Bank town of Nablus Saturday, April 20, 2002. Another child and the car's driver were injured in the accident in the village of Howara, near Nablus. Palestinian photojournalist Nasser Shtayyeh weeps as he carries the body of his five day old baby daughter Dunya before her funeral in Nablus April 19, 2002. Shtayyeh, who works as a photographer with the Associated Press, said that Dunya was taken ill and died last night on the way to hospital after they waited three hours due to roadblocks for an ambulance to enter their home village of Salem. Hospital workers prepare the body of a child for burial, outside a makeshift morgue in Nablus Thursday April 18, 2002. The bodies of over 70 Palestinians killed in Nablus during the Israeli incursion were being prepared for a mass burial. Palestinian Red Crescent volunteers cover the remains of a dead Palestinian woman killed in the Jenin refugee camp, Wednesday April 17, 2002. Palestinians pulled out more bodies Wednesday from the rubble in the camp, where the death toll remains unknown. 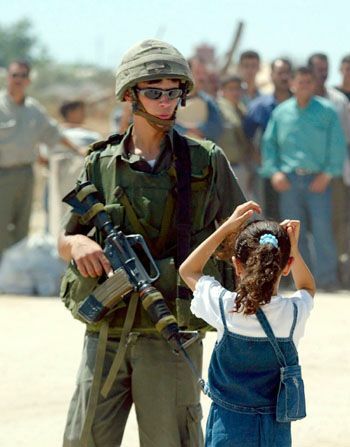 An Israeli soldier protects himself from the smell of death overwhelming the Jenin refugee camp Tuesday, April 16, 2002. Palestinians claim that hundreds of dead are buried in the rubble of the camp. Smoke billows over the Church of the Nativity in Bethlehem following several explosions as Israeli forces continue to surround the compound. The Israeli army erects a giant loudspeaker over the Church of Nativity in Bethlehem, April 13, 2002.